Today the nose skeleton was attached and the bottom skin was installed. 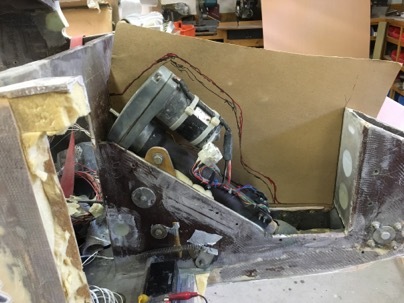 I did all sorts of planning for where the skin would go on the bulkheads. Later I found it was a complete waste of effort. 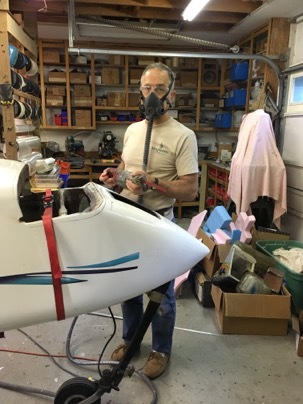 The pitot tube was a great support for holding up the skeleton while I installed the nose floor. It was somewhat of a play day for me making templates and shop organization. While, I trust myself to carve the nose by eye adequately by eye, but I have an old saying to: “trust but verify”. 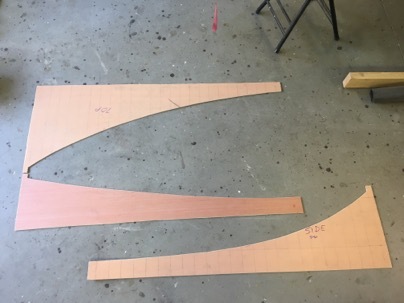 It really didn’t take to long to lay out the templates on some 1/4 luan plywood and cut them out on the band saw. 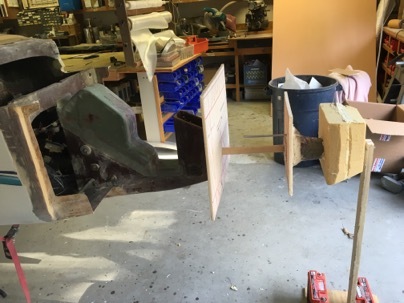 The new shape of the nose is revealed. On the templates I drilled hose near each corner. 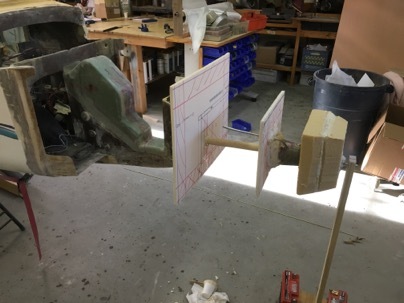 After attaching the foam walls, if I sand down to the point that I hit a tattle tail hole in the corner, I will stop shaping the corner at that point. It will give me a 1/2” wall thickness. 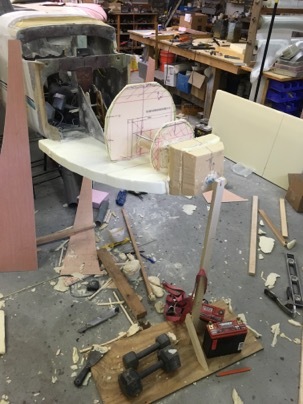 Tomorrow I plan to pre-curve the sides, bottom and top prior to assemble. Another interesting day ahead. Today’s 6 hr day, was focused on assembling the nose skeleton as I call it. 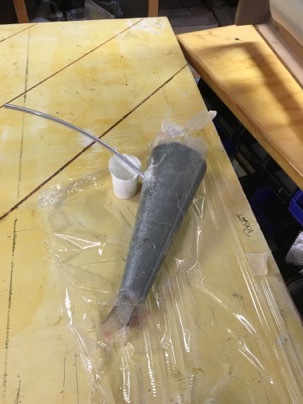 It is the scaffolding needed to attach the foam on the nose. 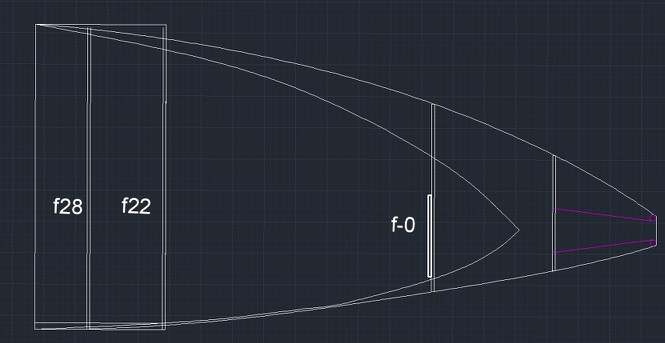 You can see the structure of the nose inlet with integrated pitot tube I made yesterday. 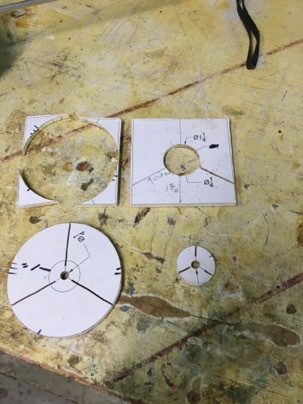 I came up with a much better way of making this part, but I think it will be good enough for me at this point and will be saved for my next plane. 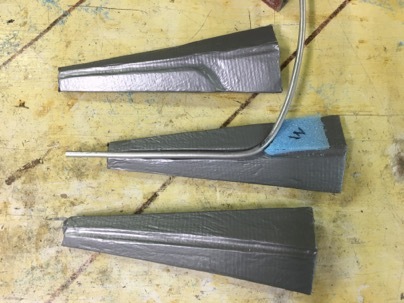 The pitot tube will also act as a centering pin for the tip of the nose. 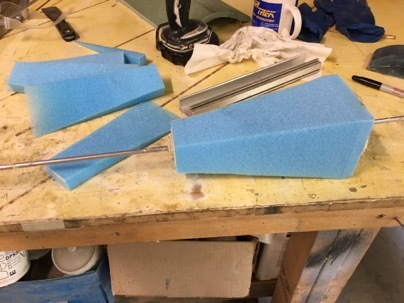 Two foam bulkheads were cut from 3/8” foam. The red marks the location of the 2” thick urethane foam cabin wall If I sand down to the inner lines, I’ll break through the foam into the cabin. 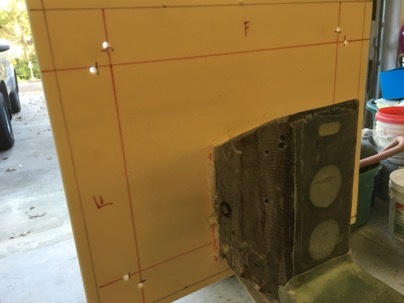 There is a mark in the center of the bulkheads for a 1” centering hole for the dowl. 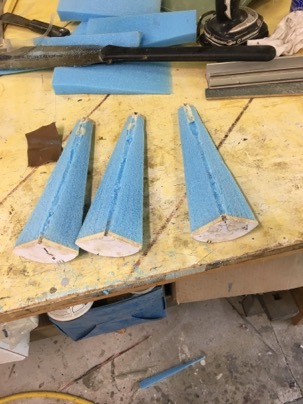 Two urethane foam blocks were cut for the tip of the nose carving. 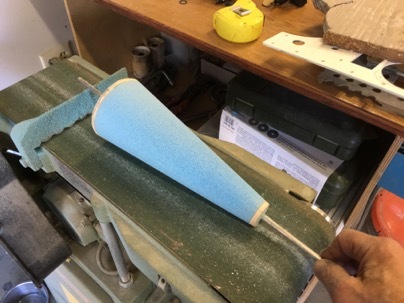 The cone was easy to use as a drill to work my way through the soft foam. Took just a minute or so. 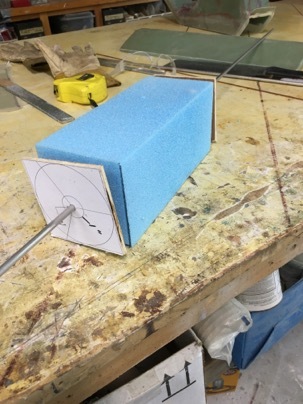 Using a 1” dowl through the centering holes, pour foam was used to glue all the components together. 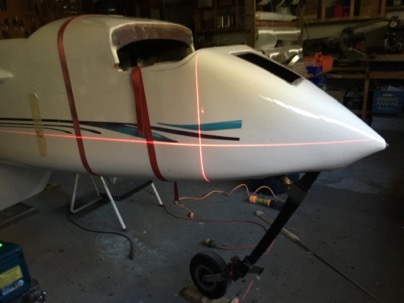 The large bulkhead was glued to the NG’s and a nose tip support was made for the pitot tube, and everything was assembled with the laser. I have earned a great deal of respect for the laser level, and pour foam. Amazing stuff! 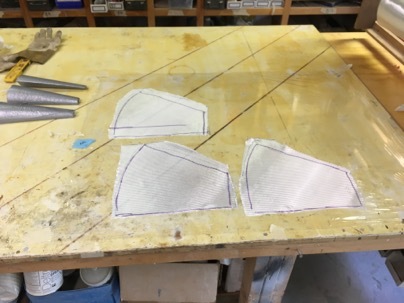 These bulkheads when trimmed will support the foam fill blocks which will be quickly carved. I really don’t think urethane foam gets the respect it deserves. Known as soft, easy to damage, nasty to work with. While removing my old nose I found when glassed in properly the foam is amazingly tough. Mine was solid as a rock even after 3 nose gear landings (2 were my fault, one a inflight emergency and 1 a gear failure). Each time I really hit hard with the nose on the pavement. 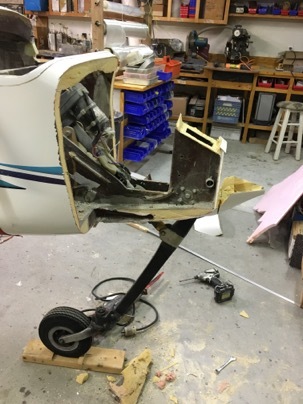 When i disassembled the nose, I found the urethane foam was as good a new. 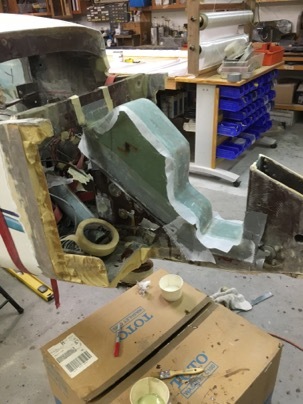 No delaminations, no crushing, extremely good attachment to the fiberglass skin. The stuff is amazing. In the future, where I can used the urethane foam I will. 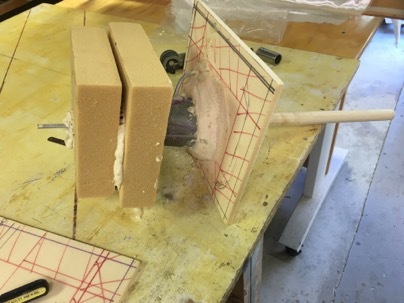 It is so easy to carve, it glues well with pour foam, and doesn’t change shape like a solid block of pour foam does over time. 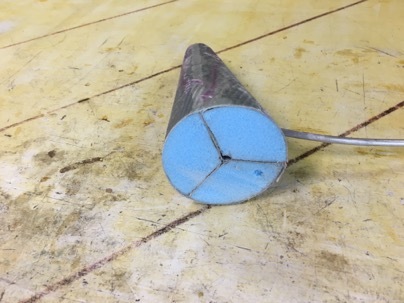 Glue the end blocks together BEFORE drilling with the cone. 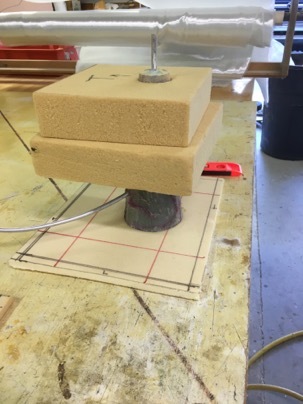 When using pour foam to glue blocks together, be sure to tightly clamp or weight the parts down because they will spread apart from the pressure of the expanding foam. 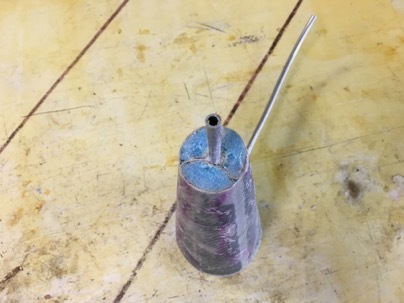 The inlet will consist of 3 pieces of foam cone (expanding the air at 7 deg per side) holding the pitot tube in the center. 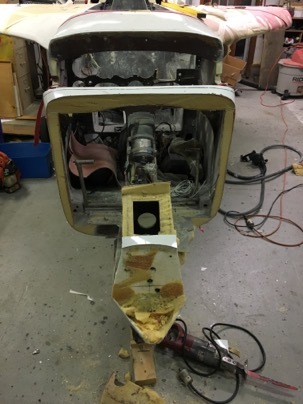 The inlet will feed a preheater for the cabin. It is an idea I captured from the Cozy Girls and wanted to make it with out the work and the pitot heat they put into their system. 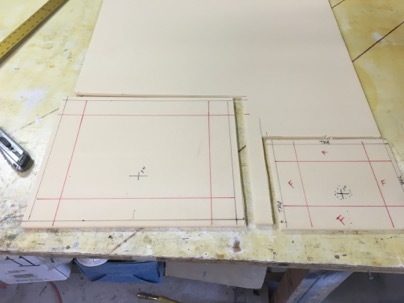 Templates were glued on to some 1/4 wood, I used the band saw to cut them out and to slot them (for cutting the foam. Using the slots as a guide the remaining wood was cut which split the cone into 3 equal pieces with a hole in the center. The only issue was I should have drilled the hole instead of pushing a rod though it. 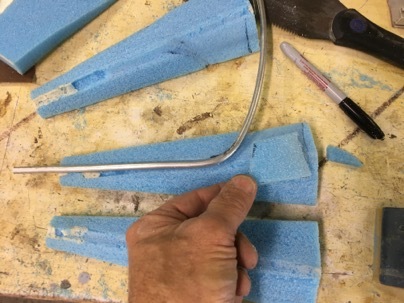 The rod caused tearing of the foam at one end instead of a nice clean hole. 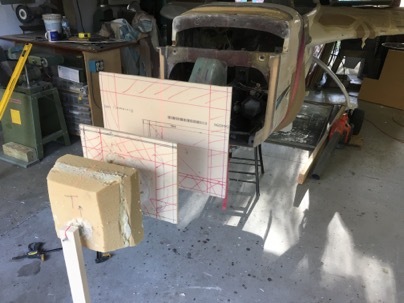 Drilling hole first, THEN cut out the foam block, then mount the templates, before shaping. 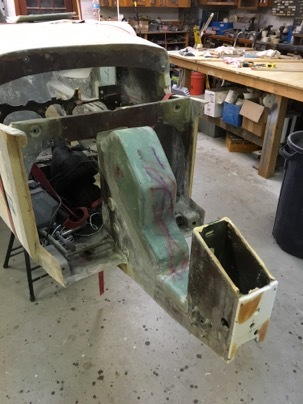 You can see the old nose and the look of the new nose. There is also cone shaped area in the nose. Notice the cone shaped area in the nose. 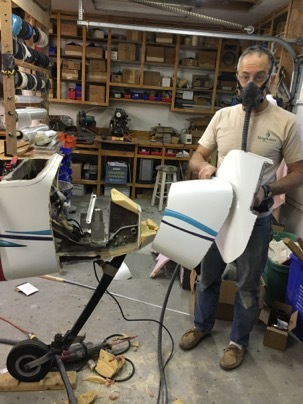 This will be the inlet for the cabin pressurization system, air preheater for the new oil heat system and hold the pitot tube. 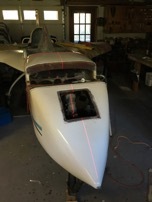 I want to completely seal the nose lift area. This is a great opportunity too seal every holes since I have the nose completely opened up. 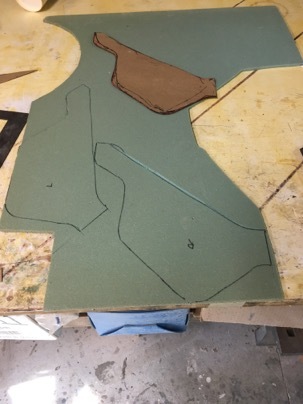 Foam was cut for 1/4” in sides and 1/8” top. then 2 layers of BID. My only mistake was I should have only used 1 layer of BID. The part came out at 9 oz!! yikes. Next time I’ll use 1 layer of carbon.